Stray kitten BK arrived at our shelter in February, and it was immediately obvious that something wasn’t quite right. Both of BK’s eyes were too small for their sockets, causing them to sit further back in the skull and reduce her vision – a condition called bilateral micro-opthalmia. BK’s problems didn’t end there. Her right eyeball had split and become swollen, reducing her vision even more. Her eyelids had also rotated inward, causing further irritation and damage to the eyeballs. BK’s eye condition was congenital, so vets ran blood tests to ensure there were no congenital issues with her organs. Finally, some good news – these tests were clear. BK’s right eye could not be saved. Although she had slight vision in her left eye at close range, this eye would cause ongoing pain and her vision would continue to decline. 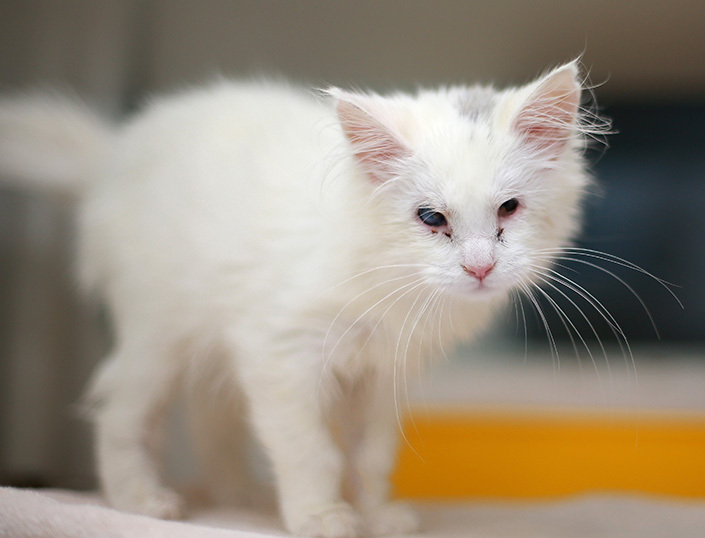 To give her the best chance at a healthy, pain-free life, vets surgically removed both eyes. During her stay at the Home’s shelter hospital, BK stole the heart of Fiona, a member of our shelter team. She spent almost a month in foster care with Fiona, allowing her to recover from surgery in a comfortable home environment. 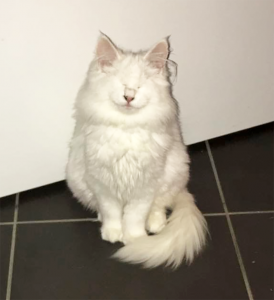 She was affectionately nicknamed ‘Blind Kitty’, or ‘BK’. BK is so brave, and being blind doesn’t stop her at all. She makes me feel like I can do anything,” said Fiona. 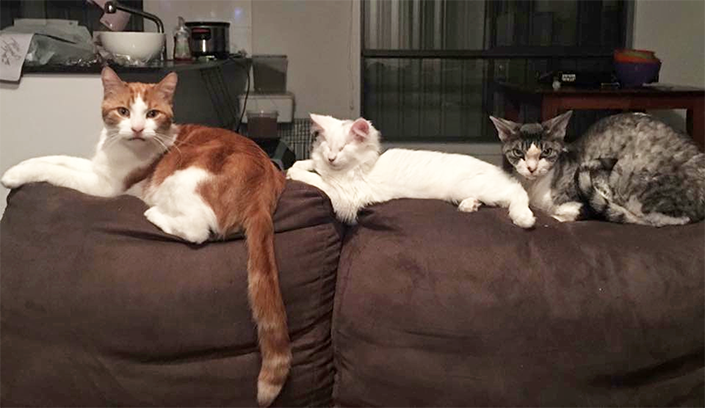 When BK’s foster care came to an end, Fiona and her partner couldn’t bear to part with the special kitten, so they made it official and adopted her. 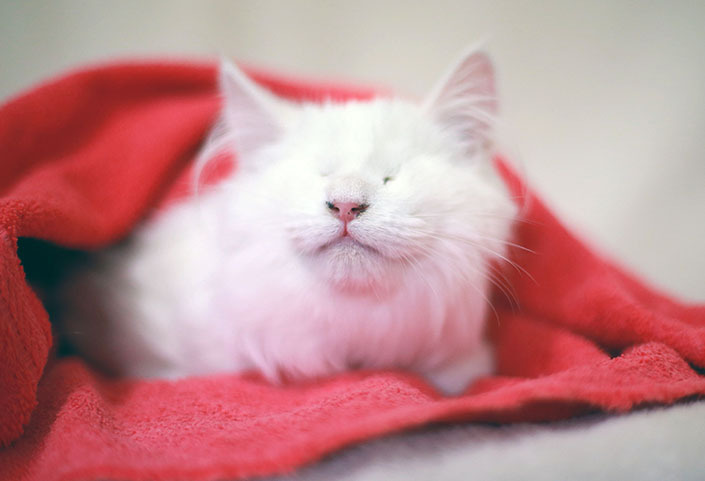 “Being blind doesn’t bother her at all. She knows where her bed, food and litter trays are and has no issues finding them. “We’ve taught her to respond to her name and clicks. She picked this up very quickly with positive reinforcement. “Our Chihuahuas accepted BK from day one and were very protective of her from our other cats, who took their time coming around to her. “Now, they all get along well and BK and Ralph (one of our other cats) snuggle and chase each other around the hallway. BK loves curling up next to me on the couch, but she always reaches out with her paw and has to be touching so she knows where I am. “She loves food-dispensing toys and toys with bells. “What I love most about BK is her fearlessness. She will launch off my shoulder with no care how far off the ground she is or if anything is in her way. BK’s surgery was made possible thanks to the support of animal lovers like you. Please donate today to help change the lives of other sick and injured homeless pets, just like BK.